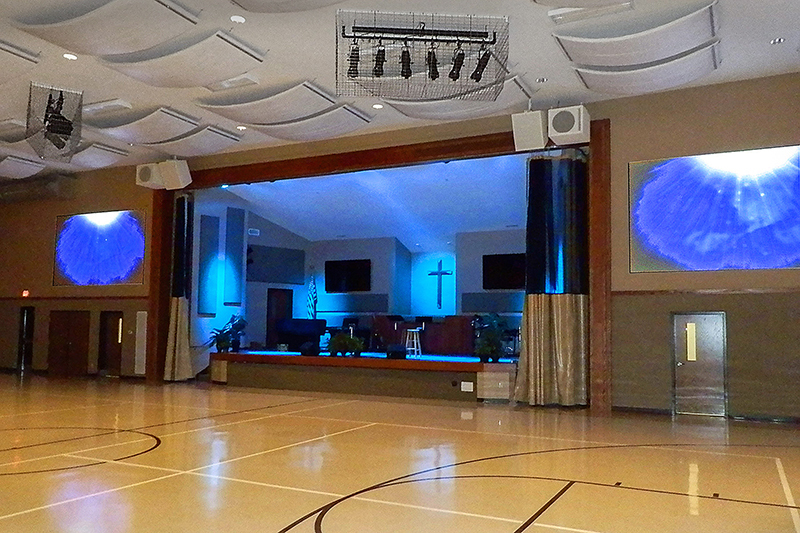 WorxAudio TrueLine X3i-P line arrays and TL118 subs on either side of the stage in the multi-purpose facility at the University Christian Church, Muncie, IN. Keeping with the room’s true multi-purpose operation, note the caging installed around the stage lights to protect from errant basketball/volleyball strikes. Churches are inherently multipurpose, multi-use spaces. Any church that serves the community it resides in must be a multi-use space or it simply isn’t doing its job. Large and small churches alike host a diverse set of events, such as worship services, Christmas pageants, weddings, funerals, classes, training sessions, department meetings and even outside corporate clients. If you’ve worked at a church for any amount of time, you know that the demands on church facilities require them to be as flexible and user friendly as possible. If you are looking to upgrade or improve your multi-use spaces, here are some guidelines and ideas for getting it right. I know it may seem strange to do a “site visit” of your own church, but if you go into it with that mentality, it will actually help you evaluate your space and make more effective upgrades. An outside A/V consultant or integrator will always do a site visit, so why not mimic that process internally? Multipurpose rooms and buildings at a church are used by a wide variety of people, from church staff to members of the congregation and even outside clients who may be paying to use your space. If you’re looking to improve your multi-use spaces, it is important to look at it from the perspective of these end users. What are their needs? What is their skill level with technology? What does a typical event in these spaces look like? Walk the space and document your findings to help inform your technology purchasing decisions. A few additional utility inputs that can cover other scenarios. We all know the realities of operating a church. There simply isn’t enough technical staff to babysit every room and every event, day-in and day-out. This is why training, documentation and printed instructions are so important for multipurpose rooms that will be used without technical support. Any good technical system starts with a set of as-built drawings that show how the equipment is wired. This will be helpful for troubleshooting, or when some of your tech staff with facility specific knowledge moves on to another job. If you are installing any sort of technical system, always try to document how it is wired, how it is powered, and how the racks are laid out. Once the system is installed, hold some basic training sessions for end users so they feel comfortable with the space. This gives them a feeling of ownership over the space so hopefully they’ll keep things in good condition, and it empowers them to use the facility without always asking the technical staff for help. A little bit of training on the front end can save you a ton of time providing support on the back end. If you can move to flat-screen displays, do it; the cost of projector lamps really adds up! There’s nothing worse than coming into your facility every day and finding it a mess. You’re now stuck cleaning up someone else’s mess for the tenth time this week. If you have a standard, default configuration for your room, create a “Restore Checklist.” This should be a simple, easy-to-follow guide that allows anyone to get your room back to its default state. Unless you have highly technical users, keep it simple and focus on things like table placement, chair placement, stage layout and instructions for turning things off or leaving things on, whatever the case may be. This will save you a lot of trouble on the back-end and it will help people feel like they are taking good care of the facilities they use.